It may seem daunting at first seeing all the competitive looking types speeding around on their flash bikes, but they all started out with the basics just like you are now, then got bitten by the racing bug. 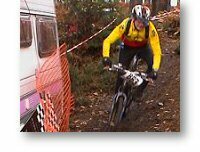 All you need to get started is a mountain bike capable of withstanding off-road riding, clothing suitable for the conditions (yes lycra really is more comfortable then denim jeans, especially when wet and muddy!) and a cycling helmet. Perhaps unlike your regular rides you'll be riding non-stop for an hour or more at a faster pace as the competitive urge takes over. The trails may well be unknown to you opening up new areas to ride in future. So just follow these handy tips to becoming a cross-country or endurance racer. Which category should I enter? 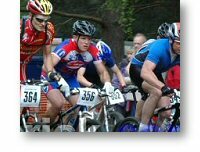 If you have never raced before or ride very infrequently enter either the Beginners (1 lap) or the Fun class (2 laps). Though most 'weekend warriors' are probably capable of 2 laps non-stop. You could always change categories at the next event to increase the challenge. On arrival at the event go to the Registration Van to collect your race number board, complete an Entry Form if you haven't pre-entered. Take note of your race start time and any special instructions. Prepare your bike, mount the race number board on the handlebars using the ties provided making sure it's fully visible. Change into some appropriate clothing for the weather and take a bottle or hydration system, plus at least basic tools and puncture repair kit. Registration opens at 8.30am for all events except the Gorrick 100 Enduro, the 12:12 Torq in your Sleep and the Merida Brass Monkeys all of which open at 8.00am. 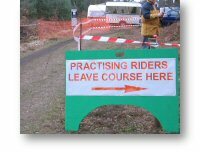 You are strongly advised to practise the course - on race day only from 8.30am - for your own safety as well as the safety of competitors (please note pre-riding of the Enduro course is not allowed). Ride to the start and follow the red & white marker tape, orange arrows, and where applicable footpath crossing signs. This gives you an opportunity to check and practice any technical sections, think about what gears to use, and to see how long a lap is. Ride this at about 70% of your normal race speed to warm-up the muscles and of course not to use up too much energy. When approaching the finish please use the Practice Peel-off route, NOT the race route past the Timing Van. Always allow enough time to get round, you don't want to miss your start. Please be courteous and give way to people already on the course racing. Now prepare yourself for the race; replace your drinks bottle, remove some clothing as you'll be working harder and getting hot, do a final quick check of the bike. About 20 minutes before the start it's advantageous to perform some warm-up sprints at race pace to get the body and heart rate really fired up. Races are announced over the PA at 15 mins, 5 mins and 1 min. With 10 minutes to go ride to the start line and get into the appropriate group of waiting riders. You are responsible for being on the start line on time. Race times are clearly displayed on the Notice Board and at Race Registration. We don't grid riders at our races, except for in some circumstances later rounds of the Spring Series, but most of the fast riders will place themselves toward the front in a natural 'pecking order'. The Starter announces that the race will start within the next 10 seconds then sounds the horn. You're off and sprinting away. Sometimes there are bottlenecks into the first narrow tracks but this soon clears, so settle into a good rhythm at a pace you feel comfortable with. Remember to drink at frequent intervals, if the race is under two hours you probably don't need to eat. At the end of each lap make sure to ride the race route past the Timing Van. They will record your number and lap time. You may even hear the commentator announce your name and position over the tannoy. When you've completed the designated number of laps just ride past the Timing Van as usual and off the course out of the way of other people still racing. Cool down by slowly riding for 10 minutes to clear the muscles of any lactic acid etc and get changed into some warm dry clothes. Return to the start to watch the other races and cheer them on. Find out your position and lap times on the Results Board, then replenish your energy stores with a burger, pasta, or hotdog. 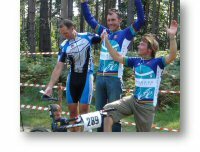 Some events are followed by prize presentations or prize draws so stick around to watch. Full results will be published on the website within 48hrs so you can compare lap times. Photos are sometimes taken which will be online during the following week so check back on the website to see if you've been captured in all your glory. Now you've got the bug go and pre-enter for the next event.